divine goal against Switzerland, he netted 4x more global searches than his fellow countryman, Pope Francis? 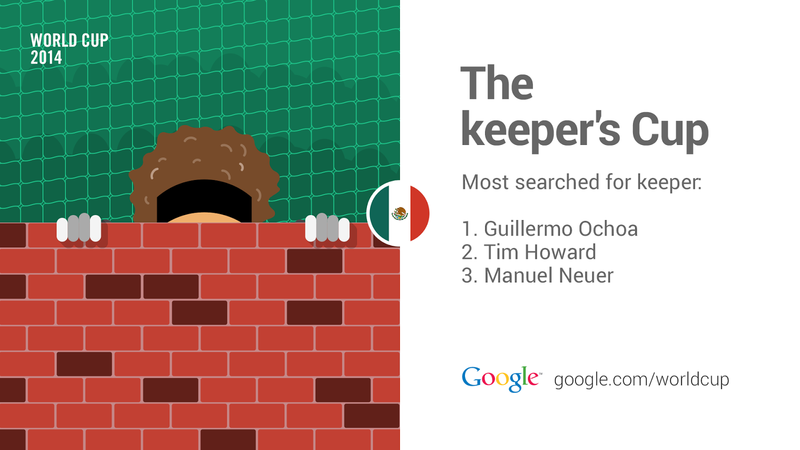 Mexico’s Guillermo Ochoa was the most searched goalie in the tournament, but Tim Howard’s heroics could hardly be forgotten. German goalkeeper Manuel Neuer not only snagged third place in search, but took home the 2014 Golden Glove award and a World Cup championship to boot. 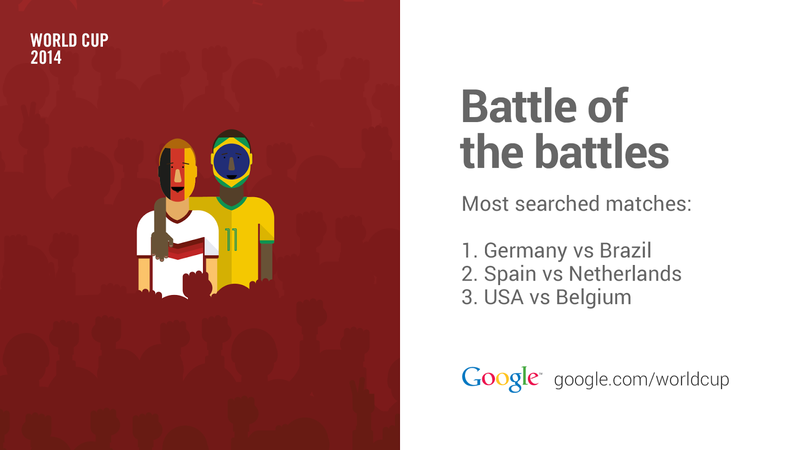 The Germany vs. Brazil semifinal was the most searched match throughout the tournament, leaving many people around the world asking, “What is the biggest win in World Cup history?” Meanwhile, some countries were ready to move on to the next opportunity: after the third place game, Brazilians searched more for “World Cup 2018” than for the final game between Argentina and Germany. 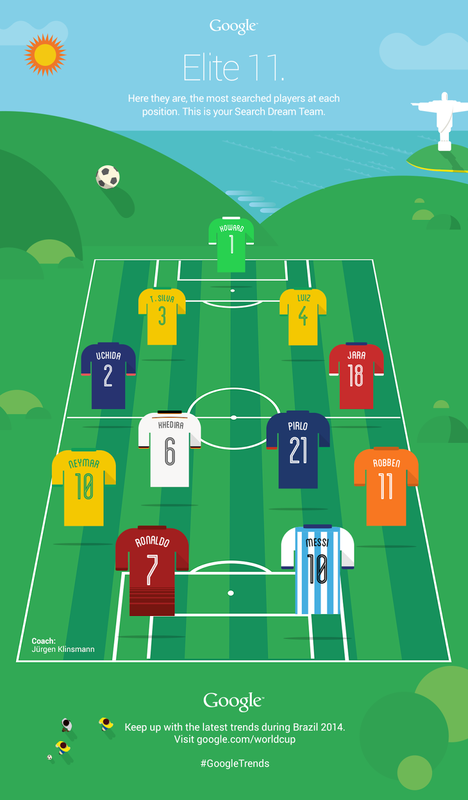 No World Cup would be complete without a few surprises—and the creative people of the web were ready to weigh in. 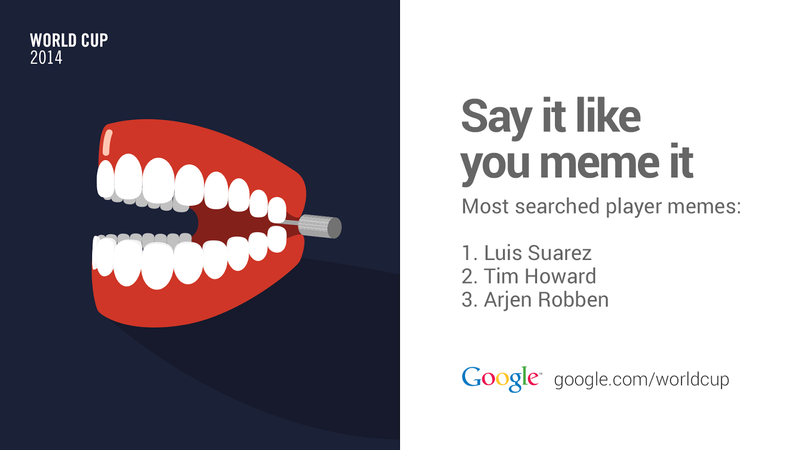 Uruguay's Luis Suarez was the most searched player meme, and at the time of the Uruguay-Italy game, there were 20x more searches globally for “Suarez Bite” than for snake, spider, tick, fly, dog and mosquito bites combined. And if a search Dream Team was created, you’d see these 11 players strutting their stuff on the field. While German star Mario Götze didn’t make this list, he was a favorite on search. Even before his goal won it all in the final, he attracted 4x more search attention than Brazilian supermodel Gisele Bündchen, who presented Germany with the championship trophy. Our team watched 107+ hours of football (we didn’t even need a water break!) and spent 250+ hours bringing you regular insights from our first ever World Cup trends hub. We hope you enjoyed the excitement of the tournament as much as we did, and for more trends, visit google.com/worldcup or check out our Google+ album. Yesterday, Germany won their fourth world championship, and, over the course of the last month, the world watched them do it—in Brazil, in bars and living rooms around the world, on their phones and laptops and tablets. This World Cup was the most digital, most connected, and most searched global event we've seen to date. There were more than 2.1 billion tournament-related searches on Google, many of which we shared on our trends hub. Looking at the trends from each match, you’ll see some topics that you’d expect to catch the world’s attention, such as top players and highly-anticipated matches. But who would have guessed that there were 10x more searches in the U.S. for the World Cup than for the NBA Playoffs? Or that Clint Dempsey, American soccer star who also has a rap single, had 2x more search interest than Jay-Z? Or that after Ángel di María's divine goal against Switzerland, he netted 4x more global searches than his fellow countryman, Pope Francis?